The pre-requisite tree ought to be considered the most important tree in the Thinking Process suite. It is the tree that allows us to overcome the obstacles that stop us from implementing our plan. It is also the tree that in fact becomes the implementation plan. And it is the tree to which timelines, responsibilities, and accountabilities can be assigned to. It is also the tree that I have most often seen skimmed over. There is an English saying that you can plan to fail, or you can fail to plan. The pre-requisite tree occupies the position of “plan” amongst the Thinking Process tools. Skim it at your peril. In developing the future reality tree and trimming any negative branches we are really developing our solution, we tailor it to our specific circumstance. Now we must deal with the substantial reservations the “yes buts” that tell us there are still real obstacles that block our progress. After all if an injection to a future reality tree is simple enough we would “just go out and do it,” and then we wouldn’t need to write a pre-requisite tree for it. If we find we can’t just go and do it we need to stop and think for a while. The pre-requisite tree is composed of two elements, an obstacle and an intermediate objective. The intermediate objective is the action that we must undertake to overcome the obstacle. 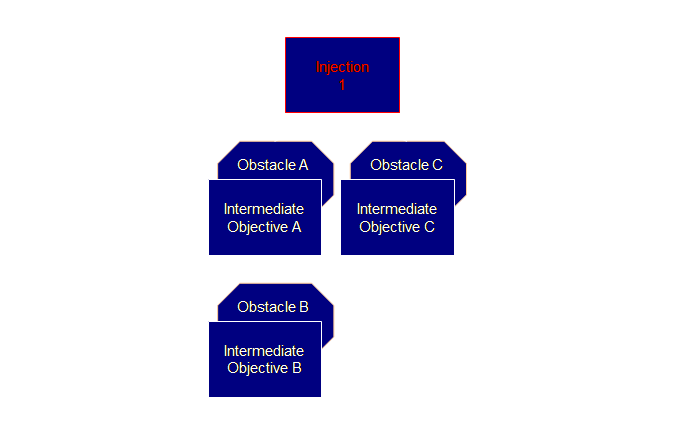 There might be several independent obstacles to an injection as in the example below (A and C), or several dependant obstacles in a chain (A and B). The obstacles are either things that exist now, which we must remove or overcome, or things that don’t exist now which we must obtain. How do we read a pre-requisite tree? Like this, from top to bottom; In order to achieve the injection we must fulfill the intermediate objective in order to overcome the obstacle. How Do We Build A Pre-Requisite Tree? How do we build a pre-requisite tree? Below is a brief description, more detailed descriptions are available in the references (1-3). 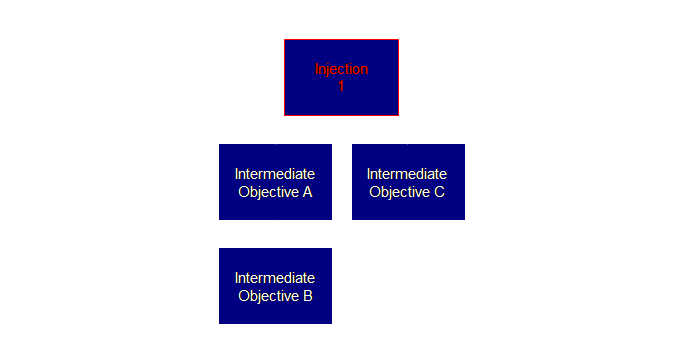 Firstly we need to choose the injection to address and then solicit; all the obstacles, and all the intermediate objectives that will overcome the obstacles. 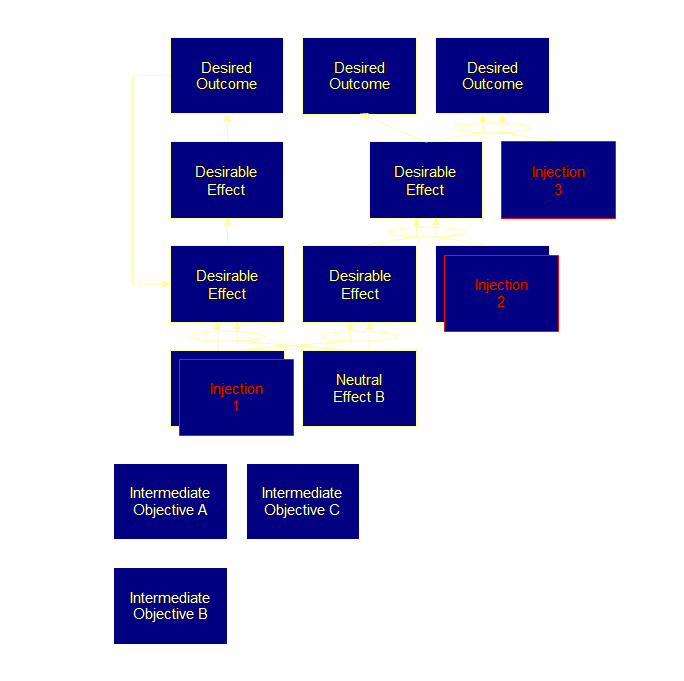 Dettmer uses the Crawford Slip method to great effect to solicit obstacles and intermediate objectives for the pre-requisite tree (4, 5). So our first step will look like this. Second step is to sequence these pairs. And therefore we have our completed tree. There may be some steps for which there are no obstacles, but it is useful to add the step for clarity (we must have it), if so add it as an intermediate objective by itself. In fact we really only need to know about the intermediate objectives – after all they are the sequence of things that we are now going to do in order to action our injection and make our future reality tree implementable. 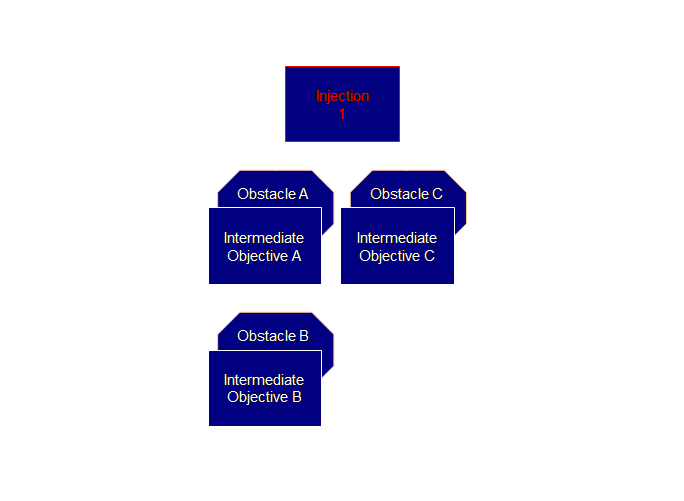 A short-hand way of displaying a pre-requisite tree as intermediate objectives alone is called an intermediate objective map or an IO map for short. The pre-requisite tree is the tool of choice for gaining understanding and agreement that there are no obstacles that can not be overcome in implementing our proposed solution. Furthermore it allows us to gain agreement on the correct sequence and plan to implement the solution. The pre-requisite tree turned on its side becomes a template for a Critical Chain project if the proper assumptions are made. For more information on Critical Chain see Newbold’s’ Project Management in the Fast Lane (6). Let’s put it all together. Let’s add the IO Map to our future reality tree. Remember we spoke of the Thinking Process trees as being a kind of LEGO for business problems. We can “ slot” this short IO map into out future reality tree example like a piece of a jigsaw and see at a glance what the effect will be of completing each of the intermediate objectives and thus the injection. Here is the full picture. (1) Dettmer, H. W., (1997) Goldratt’s Theory of Constraints: a systems approach to continuous improvement. ASQC Quality Press, pp 236-281. (2) Dettmer, H. W., (1998) Breaking the constraints to world class performance. ASQ Quality Press, pp 169-188. (3) Scheinkopf, L., (1999) Thinking for a change: putting the TOC thinking processes to use. St Lucie Press/APICS series on constraint management, pp 193-217. (4) Dettmer, H. W., (2003) Strategic navigation: a systems approach to business strategy. ASQ Quality Press, pp 91-93 & 215-228. (5) Dettmer, H. W., (2003) Brainpower networking using the Crawford slip method. Trafford Publishing, Inc., 181 pp.